Imagine an industrial heat gun that won't burn film! The PacWrap Shrink Wrap System is designed for any application from delicate gift baskets to wooden toys, to cosmetics. Use our shock resistant heat gun at your retail store directly on the film for a perfect package. • Each system includes a shrink gun, a cutting and sealing unit & a 500' roll of film. • Meets FDA requirements for non direct food contact. Impulse Sealers For polybags and tubing. Seal PE/PP up to 12 mil thick. 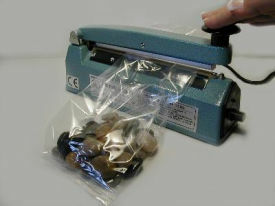 • Industrial, heavy duty, and automatic sealers are also available for use at your retail store.